I’ve been invited to debate in opposition to the motion ‘This House would completely separate the state from religion’. Debating alongside me is Bishop of Coventry, Dr. Christopher Cocksworth, a member of the Lord’s spiritual of the House of Lords (UK Parliament). The two who will be debating in support of the motion is Nazir Afzal. Nazir was Chief Crown Prosecutor for the North West of England, and Professor Steven Kettel (Associate Professor in Politics and International Studies at the University of Warwick). The debate will be voted on at the end (so can depend on the prejudices of the audience. Last time I remembered the majority of attendees were secular/atheist), so your duas (supplications) would be appreciated, as ultimately it is Allah (swt) who brings victory. For more information, read Warwick Union’s event page here. Even though it is easy to forget sometimes, the UK still has a state religion. Is this still appropriate in a time where society grows ever more culturally and religiously diverse, as well as high drop-out rates that worry the Anglican church? Or can a religious state offer advantages to a multicultural society? How does a state church interact with members of other faiths? Come to our second debate at 7pm on November 5th in MS01 to watch our extremely high profile panel debate whether a separation of the state and religion is a good idea or not. His research focusses on the politics of secularism, non-religion and the role of religion in the public sphere. Nazir Afzal was Chief Crown Prosecutor for the North West of England and formerly Director in London. Duringhis 24 year career, Nazir has prosecuted some of the most high profile cases in the country and advised on many others. Nazir has campaigned tirelessly on a range of issues including Violence against women and girls, child sexual abuse, and honour based violence. He has advised UK government ministers and trains lawyers and judges from other countries. His prosecutions of the so called Rochdale grooming gang, BBC presenter Stuart Hall and hundreds of others were groundbreaking and drove the work that has changed the landscape of child protection, particularly girls. He now gives expert perspectives on all justice issues including radicalisation. He is a renowned inspirational & motivational public speaker & trainer internationally on diverse issues and chairs conferences worldwide. He hosts awards ceremonies and delivers after-dinner speeches to audiences of hundreds.Nazir is a tutor for several leadership programmes in the public and private sector and has made presentations to dozens of diverse organisations in this country and abroad. He is on the European Union and Council of Europe list of expert speakers. He has an outstanding communicator and given hundreds of interviews across media platforms. Nazir is also legal advisor to the BBC EastEnders drama series, regular contributor to BBC, ITV and Sky TV and sits as a Trustee of several NGOs including Roshni in Scotland Halo in England and is former Chair of the Prince of Wales’ Mosaic Trust. He is Pro Chancellor of Brunel University and an Honorary Fellow of the University of Central Lancashire and awarded an Honorary Doctorate in Law by the University of Birmingham. He also works with the UN Human Rights Council and several other countries. Nazir writes regularly for national newspapers. AccoladesNazir’s has received many accolades, in 2005; he was awarded an OBE by the Queen for his work with the CPS and involvement with local communities. Christopher Cocksworth is the Bishop of Coventry having been formerly Principal of Ridley Hall, Cambridge. He has published widely in the area of Christian Theology. In addition to his diocesan duties, the Bishop is also Chair of the Church of England Faith and Order Commission. The Bishop entered the House of Lords in January 2013 with special areas of interest in education, ethics of beginning and end of life; foreign affairs on which he is lead Bishop, especially in relation to matters of conflict, war, peace and reconciliation. He serves on the All Party Parliamentary Group for Freedom of Religion or Belief, the All Party Parliamentary Group on Conflict Issues, and on the All Party Parliamentary Group for Religious Minorities in Pakistan. As well as being involved in a number of different charities and organisations, he is Chair of the Inter Religious Platform for Article 18, which is a loose network of religious leaders and representatives committed to combatting religious persecution and advancing freedom of religion or belief as defined by Article 18 of the UN Universal Declaration for Human Rights. Bishop Christopher is married to Charlotte and they have a large family. Among his hobbies, is organic fruit and vegetable gardening, and although a latecomer this is increasingly becoming quite a passion. 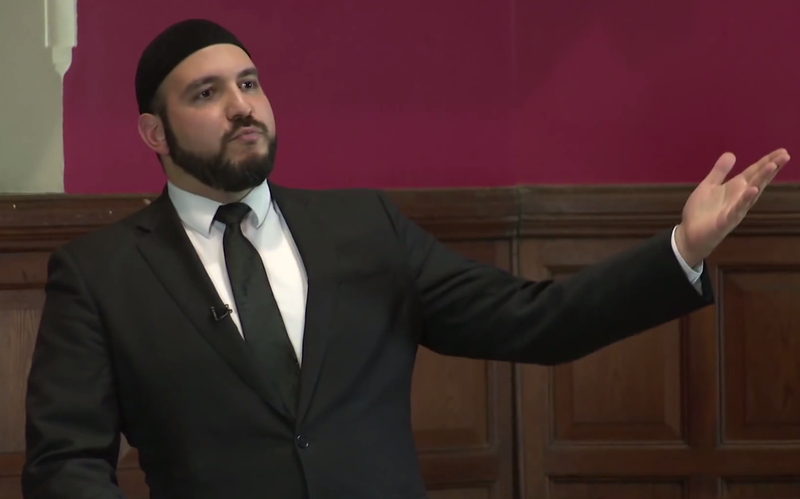 Abdullah al Andalusi is a public speaker, debater and lecturer on Islam and Muslim affairs, speaking in universities, mosques, churches, community centres and on TV. He has had a long experience of working in the Muslim community, and his activities involve researching, writing and talking extensively on Islamic revivalism (nahda), theology, philosophy, the physical sciences, the humanities and political philosophy. He also has engaged in a number of debates with people from a variety of beliefs and political persuasions on a variety of topics from theology to political philosophy. In 2009, he co-founded the public discussion forum: The Muslim Debate Initiative, a forum that promotes open dialogue and critical debate between thinkers, academics, politicians and public speakers of all backgrounds.